Time to leave. I've seen everything. 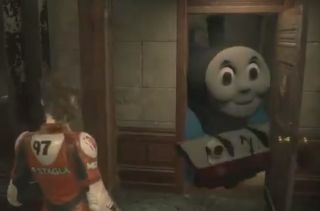 If transforming Skyrim's dragons into trains from Thomas the Tank Engine wasn't enough for you, now you can also alter Mr. X's visage into that of a smiling demented Thomas. Following on from popular mods that made DMX play when Mr. X approached and the unforgettable one that showed us what he's wearing beneath that signature trenchcoat, the latest mod from the meme factory not only turns Mr. X into Thomas, it adds his theme music too. It's the work of modders ZombieAli (who made the model for Thomas), and DJ Pop (who added the music, and previously made the X Gon' Give It To Ya mod). You can download the model here and the music and sound effects here. And of course, if you want to combine Thomas with DMX, that's an option too.